Welcome to another fun update of Albert the Alien, and the inside of the Greyson household. 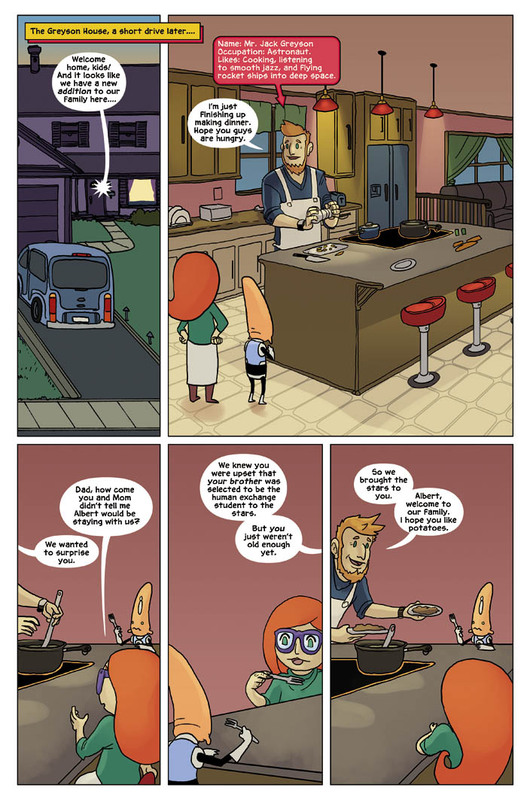 Here we meet Jack Greyson, Gerty’s astronaut father, who is making dinner. Gerty’s brother was apparently the representative from Earth who went to be the first exchange student from the little blue planet that could – and Gerty, in exchange, gets to have a new housemate from another planet! We will see more of Albert’s domestic life in this and future stories, to be sure. And the Greyson household will play an important role in his discovery of our planet. However, this story will focus on food – but what might be normal food to us would be completely alien to Albert! This weekend I’ll be a guest of honor at Anime Iowa! It’s my first time attending this show, but it sounds like a lot of fun and I’m really looking forward to it. Like all other appearances, I’ll be working the artist alley table during the day, and working panels at night.